Smoke mix is a composition designed to produce smoke upon ignition. A common formula for a grey/white coloured smoke device is a mixture of the oxidizer Potassium nitrate, and sugar. This formula has another very similar variant in which the ingredients are left in powder form and the granulated sugar is replaced with icing sugar. The volume of smoke produced is approximately 600 times the volume of mixture used. The exact ratio is not as important in this mixture as in candy propellant, which is a similar mixture. Smoke mix can be made in many ways, you can either mix Potassium nitrate and Sugar dry, in a 60/40 mixture by weight, or, for a better smoke mix, you can melt them down together over an electric hot plate. You should NOT make a batch more than 100 grams total at once, as the larger the batch, the harder it is to evenly cook. For a safer consolidation method than melting see below. As mentioned previously this mixture can be used in a dry state by individually grinding the chemicals into a fine powder and mixing together until it is homogeneous. You can also use icing sugar which is already a fine powder. However you will get a far more superior result if these chemicals are melted together. Also, adding a small spoonful of baking soda to the mixture before the heating phase will slow the burn rate effectively creating more smoke. This method can be dangerous if not followed correctly! The melting of sugar and potassium nitrate can lead to the ignition of the mixture. Do not melt this mixture without taking proper precautions such as having a water source near to control an accidental ignition, never cooking over an open flame, and never cooking inside or near flammable material. In this example we are are going to make (outside the house) 50 grams of smoke mix. Measure out 30 grams of potassium nitrate and 20 grams of sugar. Put the sugar in a heat proof container and place over a heat source. Stir it until it melts into a brown, caramel-like liquid. At this point, remove the container from the heat source and add the potassium nitrate. Note this mix is very, very hot and will burn you if you get it on your skin. Using a mixing stick scoop out a lump of mixture and plop it on a hard surface, concrete for example… or even better wax paper on concrete. You could even load it into a small tube if you wish. While the mixture is still soft insert a length of visco fuse or black match. It will take about 5 minutes to cool to a state where it will be rock hard. When completely cool you can remove it from the hard surface. Apparently the smoke produced is non toxic, however with all chemicals and burning compositions please treat them with care and respect. Obviously do not light this anywhere that might cause an accidental fire, like dry grass, on top of leaves etc. Also it has been said that reducing both above percentages by 2.5% and adding 5% sulfur works better. A smoke mixture containing sulfur will produce toxic Sulfur dioxide gases. If you wish, this smoke mix may be catalyzed to burn much faster by adding a small amount of red iron oxide (+1%) during the melting phase. For a slower burning mixture, reduce the above percentages by 2.5% and add 5% Sodium bicarbonate. This slows the burn rate, allowing the mixture to burn longer and preventing it from taking off like a rocket. Take the powdered mixture of potassium nitrate and sugar and place it in a paper or soft plastic cup, wet it with enough water to make a thick paste, (as thick as oatmeal). Stir this with a chopstick or plastic spoon until evenly mixed. Then place the wet mixture on wax paper in little mounds of about a tablespoon each, insert a fuse in it, and allow to dry for one or two days. (The drying time will depend on your climate). This will produce a semi-hard lump somewhat similar to the melting process. If a rock hard lump is desired you can use shellac which comes as a solution in alcohol in the hardware stores for furniture finishing. Note: this is usually methyl alcohol, which is toxic, so best to let it dry outside, or with plenty of ventilation. This is one of the things professional fireworks makers use for binding powders together. A tablespoon of nitrate-sugar powder mixed at room temperature with about a half teaspoon of the liquid shellac will give a thick paste, adjust the mix until you get something as thick as oatmeal. If shellac is used it is necessary to raise the amount of Potassium Nitrate by 5 % to 10% (depending on how much shellac you use). This is necessary to burn the shellac which produces about as much smoke as sugar. Insert the fuse while the mixture is still wet. The shellac mixture dries best if it is not more than a tablespoon at a time, and pressed fairly flat (about 1/4 inch thick), because if large quantities are used it forms an outside crust which prevents the inside from drying. Drying time is two to three days. If you want a faster drying mixture first dilute the shellac one to three with rubbing alcohol (isopropanol) Use 100% alcohol if you can get it, 90% minimum. Use the diluted shellac in the same proportions (one half teaspoon to 1 tablespoon powder) to make a paste, and this will dry better. Don’t ignite more than a tablespoon or two of the dried mixture at a time, and only use paper cups as containers, and of course don’t set it off were it could start a fire. Either of these methods produce about as much smoke as the melting method but with far less risk of it igniting by itself. 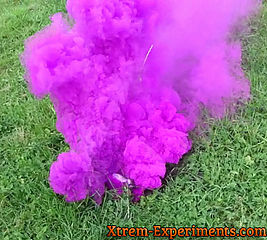 Check the article dedicated to colored smoke mix.